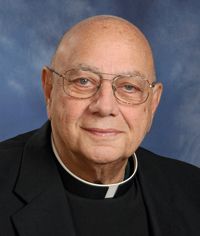 Father James J. Melle, 74, a former teacher and parish priest, died Oct. 24. Born in Norristown the son of the late Peter Melle and the late Carmella (Carfagno) Melle, he attended Holy Savior School and Bishop Kenrick High School, Villanova University and St. Charles Borromeo Seminary. He was ordained May 20, 1972 at the Cathedral Basilica of SS. Peter and Paul by Cardinal John Krol, and his first assignment was as parochial vicar at St. James Parish, Elkins Park. He also served at Our Lady Help of Christians, Abington; Assumption B.V.M., Philadelphia; St. Madeline, Ridley Park; Assumption B.V.M., West Grove; St. Mary Magdalen, Media and St. Agnes, West Chester. In education he taught at Archbishop Wood High School, Bishop McDevitt High School, Archbishop Prendergast High School and Bishop Shanahan High School. He retired from active ministry in 2011 because of declining health. There will be a viewing for Father Melle at St. Helena Church, Blue Bell on Wednesday, Oct. 31 beginning at 9:30 a.m. followed by his funeral Mass with Bishop Edward Deliman as the principal celebrant. Concelebrants will include Archbishop Joseph Kurtz of Louisville, Ky.; Msgr. Sweeney; Fathers Charles Noone and Joseph Brandt; Msgr. Aloysius Callaghan of St. Paul, Minn.; and Bishop Bevard, who will be the homilist. Father Melle is survived by his brothers Anthony and Charles, and many nieces and nephews.